It had been some time since I last trekked, so I grabbed the first opportunity that came my way. With Tattva again, Kavnai it was! And the exciting element here was that it was a night trek. Though the thought of travelling all the way to Kasara and then Igatpuri played a lazy ruckus in my mind till the last minute, I finally shoved myself into the last train to Kasara. The base village of Kavnai is around 18 kms from Kasara station. Jeeps are lined outside the Kasara station to take you to various destinations like Igatpuri, Bhandardara, Nasik etc. but to find a ride at such an unearthly hour, one has to call and book in advance which our trek organisers had already done. The ride costs around INR 100 per person up to Nasik. We reached Kasara around 2 am, the train running late and after refreshing ourselves at a dhaba on the highway en-route, we reached the base village of Kavnai at 3 am. There are 2 temples dedicated to Shri Ram and Sita and Hanuman. We had a local guide for assistance. So finally at 3:30 am we embarked on our journey to the top of the fort. Like ghosts, swaying our torches as we moved through some houses, we were welcomed by barking dogs ready to pounce on us. Thankfully, they kept their shiny pointed teeth to themselves and were satisfied killing the silence of the night. In the darkness we could barely see the top of the fort. The initial part of the trek was covered in scree and was very slippery. Without a torch, on these narrow twists and turns, it would be very easy to take a wrong step and reach the base of the village tumbling in no time. All of us expected a cold night and we were dressed accordingly but the climb had us sweating in no time. Halfway through the trek, one comes across a small hillock giving you the first glimpse of the Mukane dam. The lovely waters of the Vaitarna can be seen from the top on the other side. As I have experienced on most of my other treks, the sky was crowded with the twinkling gems and someone pointed a satellite as well. Our trek guru briefed us that the great Maratha king Shivaji Maharaj secretly visited this fort and had included this fort in his kingdom after his coronation. This fort, like most other forts in Maharashtra was captured by the British and was under their rule for a long time. Another few minutes of trekking over the hillock and we reached an iron ladder. The climb from here is nearly perpendicular and needless to say a bit challenging. It would be more challenging in the monsoons I’m sure. A little above the iron ladder is the door to the fort and seems to be the only structure that is in a relatively good condition that assures you of an entry to a fort, not just another mountain. We reached the top of the fort in the dark in less than an hour. There is a big pond on the right of the plateau. We decided to explore the fort post sunrise. So, after transferring the cakes, chaklis, wafers etc. from our bags to our stomachs, the melody of the guitar strings was brought to life by Sai, and a romantic rendezvous began in the still of the night. A few hours later, the children in the sky made a disappearing act back to their homes as the reddish hues spread across, asserting the arrival of the Sun god. The tranquil waters of the Vaitarna were set on fire as the glowing orange sphere grew in proportion. We caught the neighbouring mountains and the beautiful landscape quietly waking up to the mesmerizing sight of the first rays. Sublime scenery for the greedy eyes! One can catch a glimpse of the Kalsubai range, Trimbak range and Tringalwadi from here. We wandered on the plateau. The calm waters of the pond looked soothing. We met a Sadhu baba feeding fish; he lives in a hut near the small temple by the pond. Less than an hour is sufficient to explore the fort and after we had our fill of sightseeing and photography, we headed back for the descent. The descent almost always proves to be a bit more challenging than the ascent. As we were descending, we could hear the temple bells clanging in the distance. Carefully treading back, we reached the base village of Kavnai in about an hour. We visited a huge and beautiful temple of Shri Ram. This is not the same temple as I mentioned before. Ask the locals for it. A giant Hanuman keeps watch over an artificial pond outside the temple. Just outside the sanctum, guarded by four elephants, is another small pond and it is said that a saint brought a child back to life by immersing him in this pond (source: our trek guide). Kavnai is a relatively easy but enjoyable trek and it can also be clubbed with a trek to the neighbouring mountains. A night well spent singing songs under the stars!! I simply love the mountains, for everything…. Sondai is a small fort, well, less of a fort and more a watch tower. It’s a part of the Karjat or Matheran range of mountains. A less known fort, the name of the fort is derived from the temple of Goddess Sondai at the top of the mountain. Sondewadi, the base village for the trek is a small hamlet of a few huts. Alighting at Karjat station, one needs to get out at the east end and catch a 6/7 seating rickshaw called a tumtum to reach Sondewadi which is around 11-12 kms from Karjat. 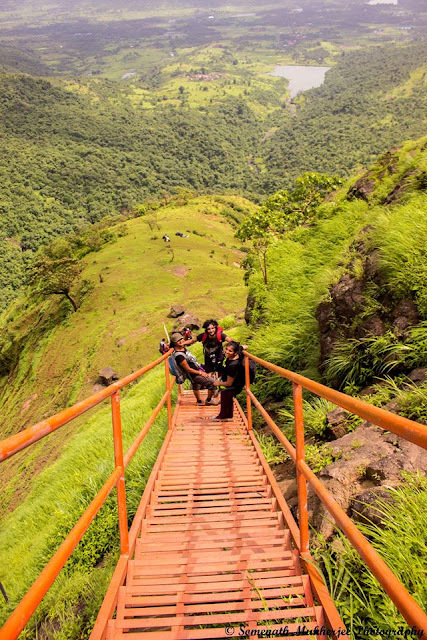 On the way to Sondewadi, one can catch glimpses of the Morbe dam but rest assured that this is not the best view of the dam one can get on this trek. There are no shops at Sondewadi, so one is better off buying whatever they need from Karjat station. This again was a trek with Tattva adventures and the count was 26 this time. So, we ‘Special Chabees’, celebrating Friendship Day, embarked on our trek and right ahead we could see the summit we were heading for. The rain God eluded us on this trek and it was extremely hot and humid as panting and puffing, we climbed the mountain. The trek is through a less dense forest and one can reach the top of the fort in about an hour or so. 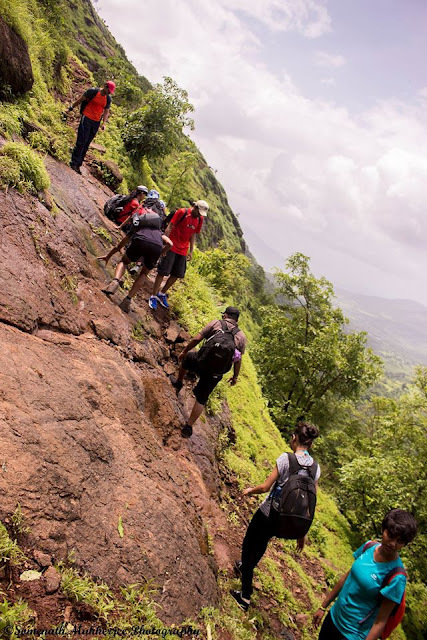 Though a relatively easy trek, it has got quite a few rock patches and one needs to be careful at these. Some of these rock patches have carved steps but in the rains it could pose to be a little tricky. After about 40 minutes of trekking, one reaches a plateau and as one turns back; the Morbe dam lies there, spread with open arms, calm and placid like a map from an atlas. Right ahead, in the distance one can see the peak of Irshalgad and to the right, the peaks of Matheran mesmerize the onlooker. These peaks of Matheran like Garbett point, One Tree Hill etc. are other trekking destinations. To the left of the Morbe dam, lies the smaller Vavarle dam. From the plateau, one can see the iron ladder which takes us to the top of the mountain. There are two water cisterns to the left, carved in the rocks, but from the look at the water, it didn’t look like potable water. Another 10 minutes of climb from these cisterns and one comes across a rock patch which is at the edge of the mountain. It’s a free climb of about 15 feet and firm grips of both hands and feet are needed. Needless to say one needs to be extra careful while crossing this patch. Once the rock patch is crossed, the iron ladder takes us almost to the peak of the fort. The top of the fort is a very small plateau with the idol of Goddess Sondai sitting peacefully under a tree. It is advisable to remove your footwear here. There are no structural remnants of the fort. Our local guide informed us that during Diwali, the temple attracts people from the nearby villages to give their offerings to the Goddess. He also told us that when the dams weren’t there, the villagers climbed all the way up the mountain to get their reserve of water from the cisterns. A ‘bhagwa’ orange flag with Chattrapati Shivaji Maharaj’s face flutters high in the sky. There is nothing much to do on the top. ‘Nothing much to do’ however is an understatement when you have such breathtaking views on the palette around you. One of my trek mates drew my attention to an amazing feat of nature. On the layered green mountain that lay ahead, a patch of grass was swaying in a wavy dance, and the small bushes, as if another part of the troupe, were dancing in a hypnotic trance; a perfect symphony to the orchestrating wind that our eyes relished and embraced. We lay on the grass, resting, lazing after having our packed lunches, appreciating the magnificence of nature. And then it was time to descend and go back home but before heading home we spent some time in the flowing water of the Morbe dam, a little away from Sondewadi. It was a very enjoyable and thrilling trek; marred only by the absence of the rains. But then, one can’t always be lucky, can they? Karnala Bird Sanctuary - A birds song ! !